Sales, Design Services, Installation, Product Service and Repair. for your commercial and business mailbox projects. We offer many options and information to help you get the products that best suit your USPS mailbox needs. We would be happy to assist you with postal approvals in the southern California area where we also offer installation. Whether you plan to serve four or 2,000 residents, cluster box units (CBU) provide a flexible solution to accommodate your building project needs. Simply select the pre-configured unit(s) that has the best options for your residents. 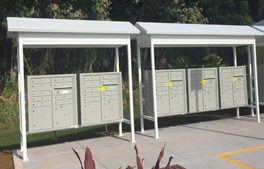 These standard units can be used individually or in larger group installations - all providing a convenient, secure method of mail and package delivery to residents. All 4C mailboxes are designed to be recessed into their mounting; whether it is directly into a wall, enclosure or surface mount collar that can be attached to a wall. 4C units are designed for interior or exterior installations and are available in a variety of powder coated colors. 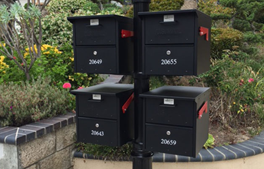 4C mailboxes can be custom designed to accommodate your situation. Just give us some basic information and we would be happy to design a configuration that will fit your project needs. Add some flare to your cluster box installations with these architectural CBU accessories. 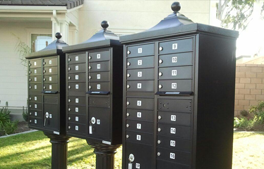 Let us design, build and install a custom mailbox enclosure for your multi-family property. These decorative curbside mailboxes bring design and functionality to the end of your driveway.